This is rather embarrassing to admit, but our lawn is a disaster. Some horrible fungus took over during the last two years, and when we had a lawn service come to tell us what they would have to do, he looked at me and said, “You need to start over!” They can’t really just spray our lawn because if they killed off all the weeds, there would only be dirt. Yes, feel my pain. 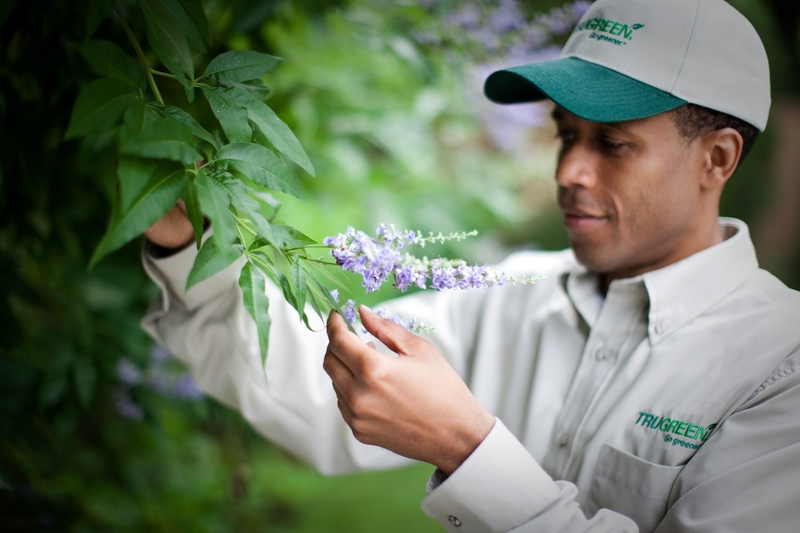 Here’s few FREE tips from Ben Hamza, Ph.D, director of technical operations of TruGreen to prepare your yard for a healthy summer. Interested in creating a Outdoor Oasis? I bet you could with $25,000! TruGreen is celebrating real stories for creating your ideal outdoor living room by offering the TruGreen TruStories Sweepstakes through October 16, 2011. One Grand Prize winner will win a $25,000 MasterCard gift card, which would be perfect for creating your perfect outdoor space. There are other prizes too. See complete details www.TruGreenSweepstakes.com/win. To get kids interested in the diverse plant world, TruGreen has collaborated with Memphis Botantical Garden to launch My Botanic Planet. This is a FREE (we love FREE) online educator resource to inspire elementary students interest in the plant world. Visit www.mybotanicplanet.comto access lessons in botany and related games & activities for your child. How would you like to win a $125 TruGreen gift card? One Balancing Beauty and Bedlam reader will win a gift card, which is good for approximately two TruGreen treatments for lawn, tree, and shrub care. 1. Comment – How is your lawn growing this summer? I received a gift card to review, and one to giveaway. Entries for this giveaway will close on Monday, June 12 @ 3p EST. The winning entry will be selected via random.org. The winner will be contacted directly and must respond within 48 hours or a new winner will be selected. We just spent A LOT of money to fix our front yard after it was destroyed by digging this winter. It’s doing pretty good but still needs some maintenance. Our front yard is growing pretty decently, but our backyard is almost ALL weeds! We need some serious help! My grass is patch across my yard. I would love lush, thick grass! Our lawn looked good as we headed into spring but now that we’ve had 10+ days with temperatures over 90 and no rain, it is really struggling. We could use a helping hand. My lawn has been growing, but so have the violets! With all the rain we had this spring, our lawn looks pretty decent so far. Our lawn is suffering, due to the drought here in TX. Watering, the lawn is trying, but we need desperate rain! It costs too much $$ to run the sprinklers ALL the time. We have a terrible time getting grass to grow in certain areas! Plus a lot of shrubs and weeds that need removed. We have a big hill in the backyard which makes the bottom of the backyard pretty much wet all the time. our lawn sounds very similar to yours: it’s all dirt because we killed all the weeds! ugh, i hate it. We bought our house in the fall and had to start over with the lawn–leveling, add soil, planting grass and trying to get it to grow. It was looking great, but has taken a turn for the worse. 🙁 Still hoping it starts to get better again. Well the summer killed a lot of it, but it is coming back thankfully! it’s so-so and could really some help! We’ve had such a WET spring that our lawn is GREEN and great right now, but when the heat of the summer hits us, that’s when it’s not so great. I’m a facebook friend, too. Our yard was completely overgrown when we moved in. We’ve got the shrubs and plants under control but the weeds are still bad. OMG my lawn is in very bad shape we are trying to get it straighten out now just got our house redone and bought in some dirt for the bare place we are going to reseed to whole front an both side yards .So this would be great if I win thank you for the chance . My lawn is starting to get dry with no rain! I’m a facebook follower and email newsletter subscriber. We’re trying to water at night, when the sun’s much less severe. We could use some help with our dirt/grass pad. We just spent this past weekend getting rid of our weed jungle and planting some new things around the house, so that looks MUCH better. However, the grass in our yard is pretty sparce…could definitely use some help! Whew. Our lawn could definitely use this. Maybe they could help up defeat the weeds that are battling the grass and winning. I already subscribe to your blog (and love it)! Since its so hot right now, its starting to turn brown. Dirt spots in the back could use some work. Our lawn is in terrible shape – not growing well at all – mostly weeds. My garden, however, is doing splendidly!! LOL. Would love to win this!! WE NEED HELP! haha! I lawn seems to be quite green, but has tons of Dandelions! I’d love to win this for my husband. It’s a constant battle against the crabgrass here. It has been so hot, I pretty much have a dust bowl for a lawn! We need our lawn taken care of. This would really make my husband happy! My lawn is need of repair. One side is very dry, one side is full of moss, and the front is full of weed. Hey, the back is doing good – one out of four. I follow you via reader. Our lawn needs some work! We have to constantly keep it watered to keep it alive, or it goes dormant. We hit 100 degrees here in WI yesterday, and our law is dead in spots already, even with the watering. I subscribe to RSS feed through google reader. It sounds like bragging and it probably is but our front lawn is very pretty. The back yard we leave plain for the boys. Our grass isn’t too bad however something is killing the hedges, we could so use the help on this one. Thanks! Our yard is so sad this would be a sweet deal! There are soo many ways to have a green lawn. have you tried non-chemical ways to have a great lawn? Our lawn would be doing much better if we had some rain! I like Balancing Beauty & Bedlam on Facebook! We have been doing a lot of yard renovation this year…building retaining walls, digging trenches, etc. The lawn is splotchy at best, at this point. our lawn is growing but it’ not green (and i’d love it to be!). we could so use this!!!!! Our yard….. Well it is not pretty. Built the house 2 years ago and the grass is still not lush. We have dandolines like you can not imagine and nothing we try seems to work. Our yard is looking fantastic thanks to my husband’s green thumb!! I’m a twitter follower and I tweeted this giveaway! My lawn is growing – only the weeds are too! My lawn is not growing well! We bought our house 1 1/2 yrs. ago. It was a rental so not much was done to the exterior. Last year we painted and did some landscaping. This year we hired TruGreen to help the lawn along. Love them so far but a g.c. would sure help! Our lawn is doing alright…its very bumpy though and I wish we could resurface it. I follow you on Twitter and retweeted…..
Well, I try to do all of the above with my yard and it does look better. The worse problems for me are the dog (everywhere she pees, the grass turns brown and dies.) and those darn moles. Has anyone ever seen Caddyshack? I would love to blow up these darn moles…hahaha!!!! I love getting your e-mails. If we could get all the moss out it doesn’t look too bad. Still nice and green from all our rain here in Oregon! So far lawn is ok but we have some spotty areas we would like to fix up! For now, our lawn is okay, but I worry when my husband deploys, I won’t be able to keep it as nice. I’m not very good at weed eating, lol! It is growing so fast!! Too fast! Our lawn is full of clover. We have clay soil & weeds grow better then grass. Our lawn is in desperate need of help. It has plenty of areas where there is no grass and truthfully most of it is more than likely weeds. It is in sad shape. Our lawn is fairly pathetic, especially on the side (where it is more a mud hole than a lawn). Ugh. Our lawn is brand new- and needs more rain! My husband and I are buying our first home in 3 weeks and I don’t know how much help our lawn will need yet! After a long harsh winter, my lawn is finally starting to come around! I live in FL and we are in a drought at the moment, so I have bare patches across my lawn. The weeds seem to be growing just fine though. The only growing well in our lawn is the weeds. Our lawn looks pretty good right now. Our lawn improves every year…..but we still have a lot of weeds…buck weed is the worst at this moment! Grubs have “browned” our lawn! Our lawn has been taken over by clover. We need help. Our lawn needs some help this summer, would love to have this giveaway! We just took out some bushes that didn’t make it through the winter. Our lawn is growing … but too much rain has caused a lot of moss and we have weeds! I subscribe to your site by google reader. I’m a Balancing Beauty and Bedlam Facebook Fan! Our lawn is awful. We need the help! Our lawn is looking so-so. Some brown patches …definitely needs to be getting more water. Now that the afternoon thunderstorms are coming, that will help! Our lawn is growing a little “crabby” (crab grass). Would love to give this to Scott! My lawn is growing poorly. It’s so hot and we’ve had little rain, the grass is brown already. My lawn isnt growing that good this year. My husband really dislikes taking care of the lawn, so it’s in shambles. Kinda resembles the empty house next door. . . this would be a GREAT prize! I subscribe to email and follow on Google Reader! !